One important message of Eating with the Ecosystem is that consumers should focus on healthy stocks so that we benefit from abundance while allowing other resources to recover. Today, this means being willing to try species that are unfamiliar to many seafood lovers. As we work to recover well-known species like cod and flounder, species such as dogfish, skates, hake, pollock and redfish present opportunities to offset lost revenue for fishermen, and for diners to try some new tastes. Fortunately, based on the results of a poll conducted collaboratively by EDF and the Center for Marketing Research at UMass-Dartmouth, consumers seem willing to give those species a chance. In the spirit of the “trash fish” dinner recently sponsored by the Chef’s Collaborative, Eating with the Ecosystem is hosting a series of dinners across New England to showcase underappreciated seafood and the ecosystems from which it comes. 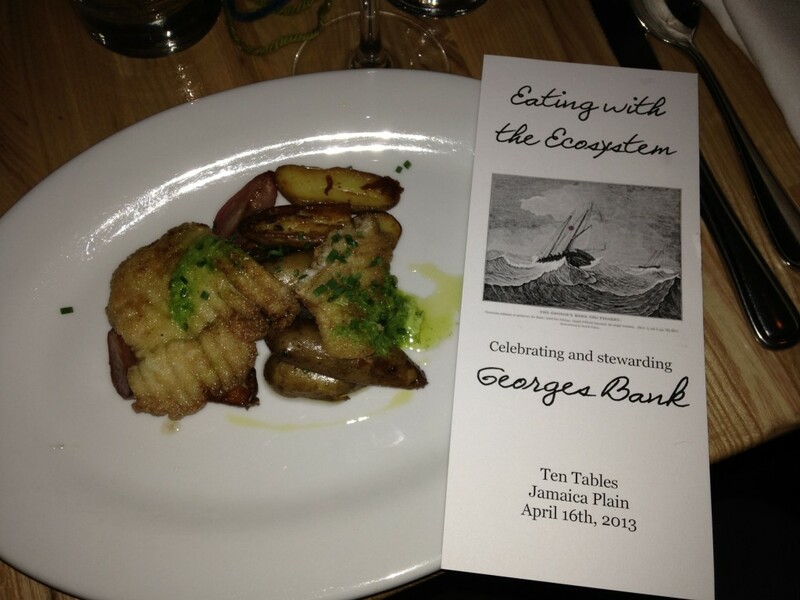 I was fortunate to attend their most recent event highlighting the Georges Bank ecosystem, which was held at one of my favorite restaurants: Ten Tables, located right in my own neighborhood, Boston’s Jamaica Plain. The menu began with a simple sea scallop ceviche served with Hakurei turnip, green apple and arugula. As the basis of the most valuable fishery in the United States, sea scallops are far from unknown in the market! But the stock is abundant, and no meal focused on the Georges Bank would be complete without scallops on the menu. Next up was a house cured hake brandade, served alongside pickles and mini toasts. There are actually three different species of hake found on Georges Bank: white, red and silver. An interesting ecological linkage between the first course and the second is that juvenile red hake take shelter inside adult sea scallops after beginning their lives as tiny larvae drifting among the plankton and then settling to the seafloor. The main course was skate wing with fingerling potatoes, radish and spring onion butter. And it was fantastic! Of course, had the skate itself been dining with us, it probably would have preferred our first course: Skates feed primarily on invertebrates living along the bottom, including bivalve mollusks such as young sea scallops. Like hakes, there are several species of skates on Georges Bank making up a multispecies complex that contributes to the groundfish fishery. Dessert took us out of the ocean in the form of a goat cheese panna cotta with rhubarb compote and amaretti. It was a nice, light way to finish a superb meal that got all diners thinking about the bounty of the sea, how it is interconnected, and ways we can help struggling fishermen by broadening our palates to savor the ocean’s abundance that we might not yet fully appreciate. This entry was posted in New England, Seafood and tagged New England, scallop, Seafood, Sustainable Seafood, trash fish. Bookmark the permalink. Both comments and trackbacks are currently closed.